So I wanted to share this amazing and scary story (true) that happened to me a number of years ago. I went with my daughter to visit the U.S. 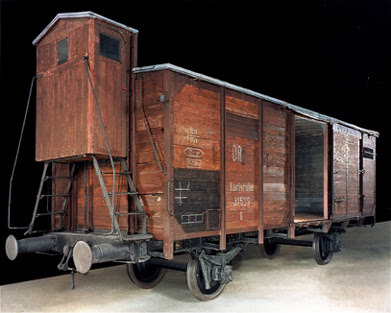 Holocaust Memorial Museum in Washington, D.C.
One of their exhibits is of a cattle car train used to transport Jews in the Holocaust to the infamous Auschwitz concentration camp. I remember how frightening it was to see this actual train car (the likes of which I had previously only seen in the movies) where hundreds of thousands of people were herded aboard like animals for the torturous trip to their ultimate murderous and inhuman deaths. At the exhibit, I'm not sure that I was supposed to do this, but being a very tactile person, I reached out to touch the train car, maybe partly because I could not believe this was the real thing where such human horrors had occurred. Immediately upon touching it, something happened to me--for a moment, everything went black and then I experienced an intense flashback (like being transported back in time and place) to literally being there with the actual people stuffed into these cattle cars--without food, water, sanitation, or enough air to breath--and I could see up close their anguished faces, and actually hear them screaming. First, I thought I have a vivid imagination and that all the studies on the holocaust and my family being survivors had really had an impact on me. But then something else happened to me. When I left the Holocaust Museum, I started to get a crazy sharp pain in the side of my neck. Not a soar throat, but like my throat just wasn't working right. I tried to sort of ignore it, but over the course of the day, it got worse and worse, as my breathing was becoming ever more difficult, and it felt like I was actually choking to death--my life was in danger. I was rushed to the hospital emergency room, and at first they weren't sure what was happening to me, and so they started a whole series of tests. Crazy enough the tests revealed a deep tissue infection right in the side of my neck, and based on the danger to my breathing and swallowing, the doctors came in to talk with me about doing emergency throat emergency. 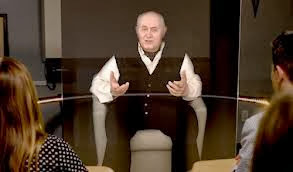 I couldn't believe what was happening--out of the blue, I touched that death car to Auschwitz and next thing I know, I had a severe tissue infection and my life was hanging by a thread. Again unexplainably, but thank G-d miraculously, overnight the dangerous infection literally just disappeared as mysteriously as it was born into my neck tissue--the doctors could not explain it! The Holocaust which claimed six million Jewish lives--men, women, children--in perhaps the most evil and hideous human event in history, and I felt like I had just been transported back in time and touched not just the car, but the actual history and event itself.